The Strategic Partnering Approach guides the participant through an approach that advances an organization’s existing business relationship management (BRM) capability to drive business value, build strategic business partnerships, and evolve enterprise culture. 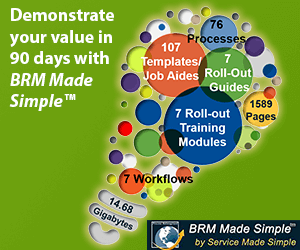 Every organization has a BRM capability. A BRM capability is a capability designed to stimulate, surface, and shape business demand across all functions (business units, sales, marketing, technology, HR, finance, etc.) and ensure that the potential business value from that demand is captured, optimized, and recognized. A strong BRM capability converges cross-functional teams and eliminates value-depleting organizational silos. It strengthens collaboration and drives a culture of creativity, innovation, and shared ownership across the enterprise, so that holistic, innovative, and value-driven strategies are created and deliver their intended business value results. The Strategic Partnering Approach is designed to help business professionals partnering with key business partners in co-creating a journey map for reaching and sustaining strategic partnerships that drive increased collaboration and ensure value recognition across the organization. The Strategic Partnering Approach serves as an addition to BRM Institute’s current BRM certification programs, BRMP®, and CBRM®, which are designed to be delivered and received at an organizational (and/or individual) level. Any organization that is advancing its BRM capability from order taking service provider to strategic partner will benefit from team engagement in this Strategic Partnering workshop. The Strategic Partnering Approach is supported by the Business Relationship Management Playbook’s content, dedicated to enterprise facilitation. The BRM Playbook ebook PDF is distributed to participants of the Strategic Partnering Approach Workshop.